Welcome to the 54th annual O.N.A. Convention page. 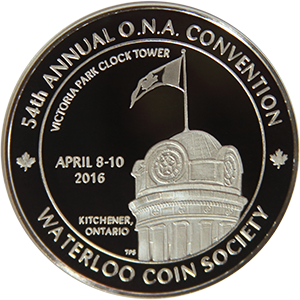 The 2016 convention was hosted by the Waterloo Coin Society. Open to the Public Saturday & Sunday at 10:00 a.m.
* for either a King size single-bed or 2 double-beds, non-smoking room. We encourage you to get the most out of the annual three day event while also supporting the organization and its activities by purchasing a main registration kit, souvenir medal or banquet ticket. Enhancements have been made to a long standing service tradition of giving back to the O.N.A. supporters, members and collectors by offering a �no frills� weekend Bourse Floor Pass and souvenir copper medals as separate items. Less than 100 main registration kits will be made available this year on a first come first served basis. Attractively priced Spousal and YN kits (under 18) are also an excellent and affordable way to get the whole family involved and start the annual tradition of attending the O.N.A.show together. Convention medals are highly sought after by many collectors given their extremely low mintage. Banquet tickets are also in great demand with many attendees viewing the awards ceremony as the highlight of their entire weekend. Advance registration provides far more benefits than just paying the daily Bourse admission and/or attending the many free events planned for Saturday and Sunday. Get the VIP treatment with the exclusive Friday kick-off celebration consisting of the Bourse preview and welcome reception attended by registrants, dealers and dignitaries. Access before the general public affords pass holders and registrants the luxury of being among the first on the sales floor while also freeing up precious time to participate in activities, socialize with collectors and attend important club and association meetings. By taking advantage of this valuable benefit not only will you feel less hurried, there is a greater potential to find that special item(s) you have been looking to add to your collection or the right dealer if you are looking to sell. Avoid disappointment by placing your order before the March 21, 2016 deadline as orders will not be processed after this date. Medals and Banquet tickets provided there are any still remaining, will be sold on a first come first served basis at the convention sales desk. Thank you to everyone who registered before March 1 for a chance to win the Early Bird Prize shown here. Congratulations to Steve Woodland who was declared the winner will be presented a $20 for $20 case designed by Lighthouse Publictions generously provided by Trajan Media at the Friday evening Welcome Reception. Our 54th convention medal design was chosen by the convention committee from a design submitted by ONA member Thomas P. Sanders. The medal features the Victoria Park Clock Tower. For nearly 50 years the tower was the focal point of the beloved Renaissance revival style city hall which was demolished, amid great controversy, in 1973. Mr. Sanders� rendition depicted below marks the first time the tower has become a focal point of a W.C.S. / O.N.A. medal. Previously in 1972, banquet medals were struck for the Waterloo Coin Society which featured the former Kitchener city hall built in 1924. A K-W Oktoberfest trade dollar was issued in 1996 to celebrate the reconstruction and formal dedication July 1, 1995 of the Heritage Clock Tower (as it was known then) in it's permanent home ending many years of discussion and debate. Today the clock tower is prominently featured as the City of Kitchener's official logo. Silver and Brass medals will be in short supply with a limited mintage of only 40. Copper will also have a limited mintage of 100 this year. Banquet Speaker - Our Banquet speaker this year is Walter Ostromecki, American Numismatic Association Past President. Our Education Chairman, Scott Douglas, is pleased to announce our Friday afternoon Education Symposium! Judy has been a member of 29 numismatic clubs and associations worldwide for the past decade, and served several in executive positions, convention and other roles; serving, as editor, nine numismatic groups at one time. Currently on the executive of the South Wellington Coin Society, and is an editor serving RCNA Numis Notes, O.N.A. The Numismatist, CAWMC Timber Talk, and SWCS Wellington Circular, and recently began assisting the IOWMC Bunyan�s Chips� editor. She has been published 10 times in the Canadian Coin News in the past 2 years. Also she has received President�s Awards, Exhibit Awards, Editor Awards, and other recognitions for numismatic organizations and clubs, and in 2015 became a Fellow of the O.N.A. Judy has been a frequent speaker and exhibitor at local clubs in the Waterloo-Wellington-Oxford areas for the last 5 years. She has other interests in the community such as her comradeship in the Royal Canadian Legion, and has worked with Junior Achievement kids. Jeff�s earliest recollection of his fascination with coinage came in 1967 when he was 4 years old, but he did not begin actively collecting coins until 1971, at the age of 8. His collecting interests now include Canadian decimals, Charter and Government of Canada banknotes, Canadian municipal and commemorative medals, coin club medals, centennial collectibles and Municipal trade currency. Over his numismatic career, Jeff has had over 500 numismatic articles published, has given presentations to hundreds of school kids about coin collecting, and has been a keynote speaker at Dynamic Earth in Sudbury, home of the Big Nickel as well as to several local service organizations. Jeff�s passion and priority is numismatic education. He believes this, along with the active promotion of numismatics in our communities, publication of numismatic material and active participation in local historical initiatives, is the key to the future of our hobby. Angus Sutherland is a retired Presbyterian minister who has long been fascinated with both numismatics and history. He discovered that his vocation and his interests could be combined in collecting Communion tokens, largely a Presbyterian phenomenon. 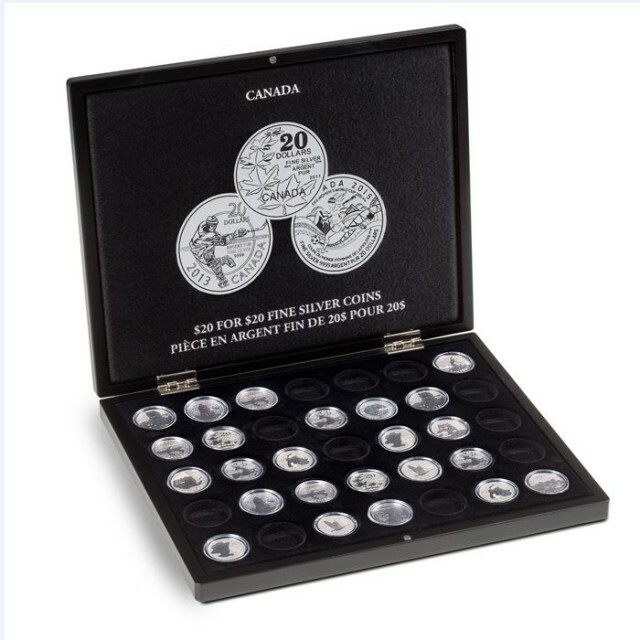 He began collecting these tokens in earnest in 1990 when he bought 200 Canadian Communion tokens from the Norweb collection. His collection worldwide has exceeded 4,000. Angus is currently working on a book on the Communion token, and particularly describing his Canadian collection, and updating (or correcting) the histories of the issuing congregations. Angus chairs the Advisory Committee for the National Presbyterian Museum in Toronto which boasts an equally large collection of Communion tokens. 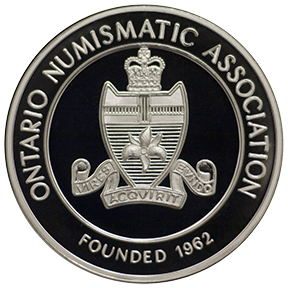 The Royal Canadian Numismatic Association, in conjunction with the volunteers of the Ontario Numismatic Association, are pleased to invite you to visit the Junior Numismatists table located just outside the bourse room. Material is graciously donated by numismatic dealers, club members and the Royal Canadian Mint. Please parents, be reminded that this table is strictly for juniors. Let your young numismatists have fun, NO prompting! The Coin Kids Auction has been a continuing success. Let's do it again this year! Coin-Kids Auction sponsored by R.C.N.A. For further information please contact our 2016 Exhibits Chairman, Colin Cutler, by email at this link.